German folklorist; born at Namslau, Silesia, March 13, 1812; died at St. Hubert Aug. 3, 1890. He studied philology at the universities of Breslau, Munich, and Berlin, and in 1849 became professor of the German language at the Athénée Royal at Liége, Belgium. He resigned his chair and retired into private life in 1867. 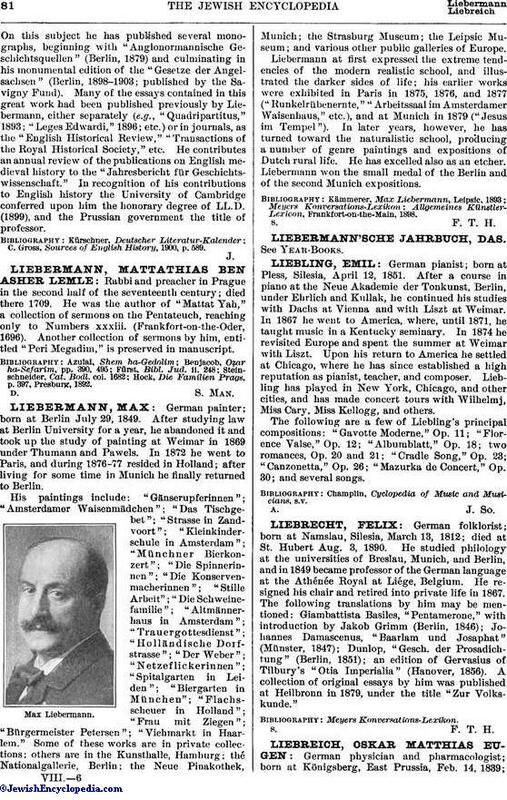 The following translations by him may be mentioned: Giambattista Basiles, "Pentamerone," with introduction by Jakob Grimm (Berlin, 1846); Johannes Damascenus, "Baarlam und Josaphat" (Münster, 1847); Dunlop, "Gesch. der Prosadichtung" (Berlin, 1851); an edition of Gervasius of Tilbury's "Otia Imperialia" (Hanover, 1856). A collection of original essays by him was published at Heilbronn in 1879, under the title "Zur Volkskunde."